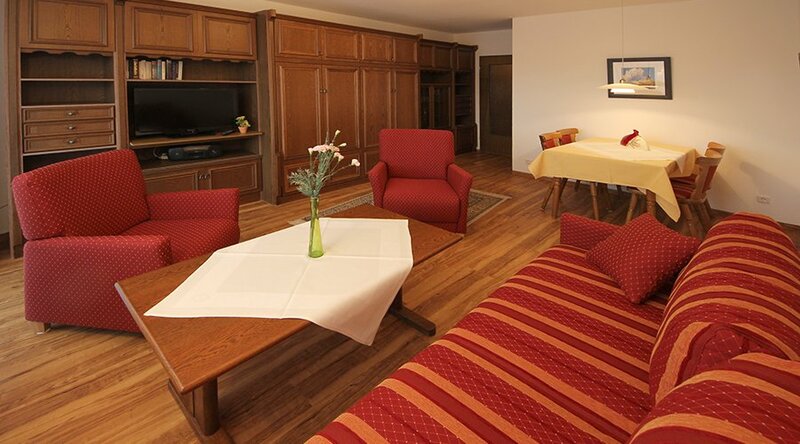 Comfortable ambience is waiting for you in our 47 cosy furnished apartments of about 28 - 110 sqm. The swimmingpool, Kneippcenter, fitness- and tabletennisroom (free of charge) let you enjoy your holiday. Sauna (free of charge), solarium (with charge) and lawn will complete your stay. Enjoy your holiday home in a central but quiet area. Wireless-Lan available for free inside each apartment. 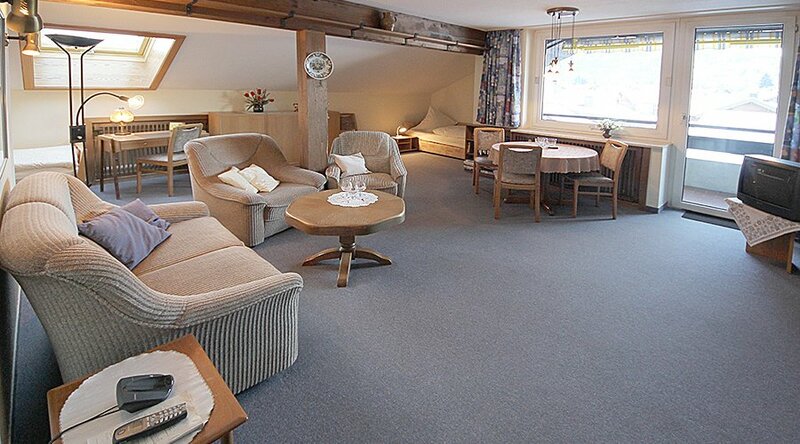 For families we offer a play area, small library and the table tennis and fitness room. You can always be reached online for your loved ones at home via our W-LAN throughout the apartment house. 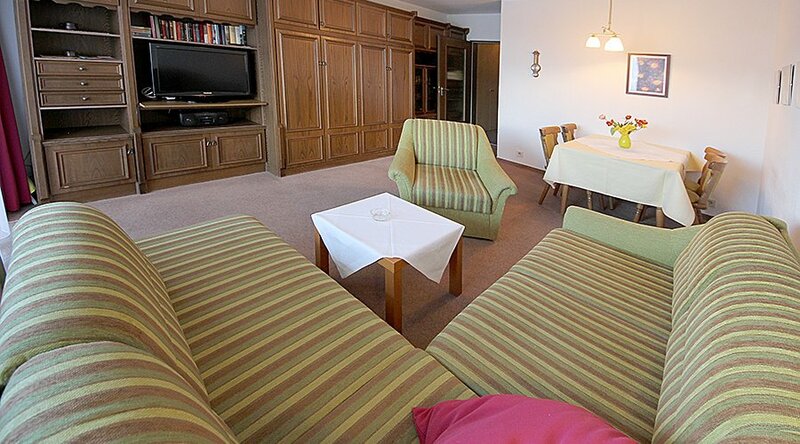 Cosiness awaits you in our well-kept and comfortably furnished apartments in Oberstdorf, in a central but quiet location. Our indoor pool, Kneipp-center, fitness and table tennis room (free of charge) are at your disposal and complement your relaxing holiday. Sauna (free), solarium (for a fee) and lawn complete the offer. 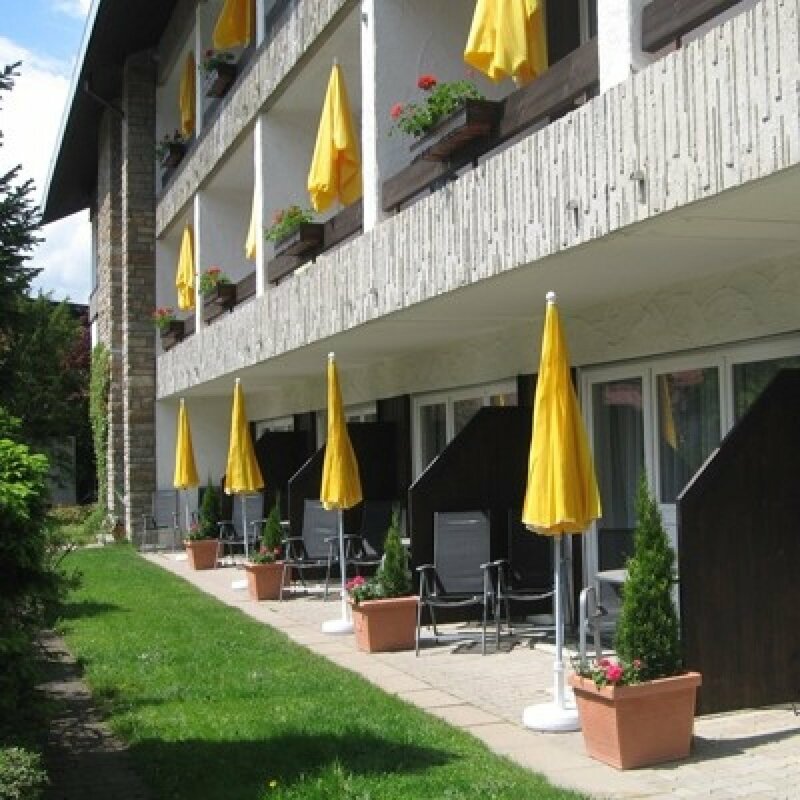 Location: Quiet and centrally located in Oberstdorf, within walking distance (500 meters) from the town center with restaurants, bars and shops. The Nebelhorn cable car and the ice rink is about 1 km. Nearest railway station: Oberstdorf (500 m). 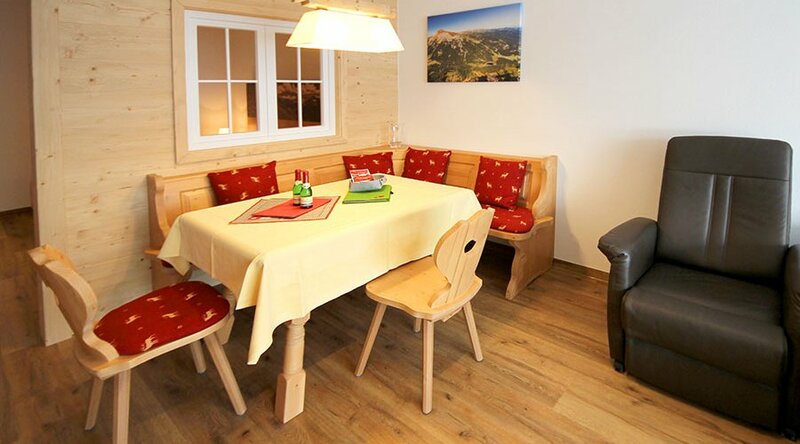 Montana Haus: hospitality awaits you in Montana house with indoor swimming pool, fitness room, table tennis, reading area, games room, sauna, solarium and a large garden with children's playground. 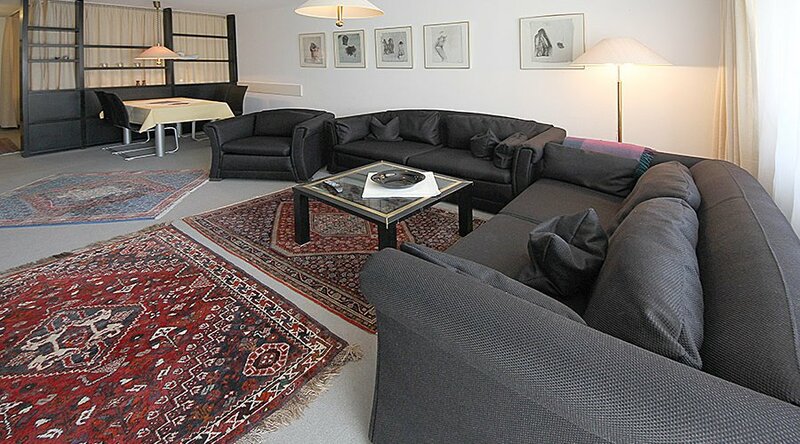 Your apartment: The bright and modern furnished 110qm 4-room apartment on the 3rd floor offers enough space for up to 6 people. 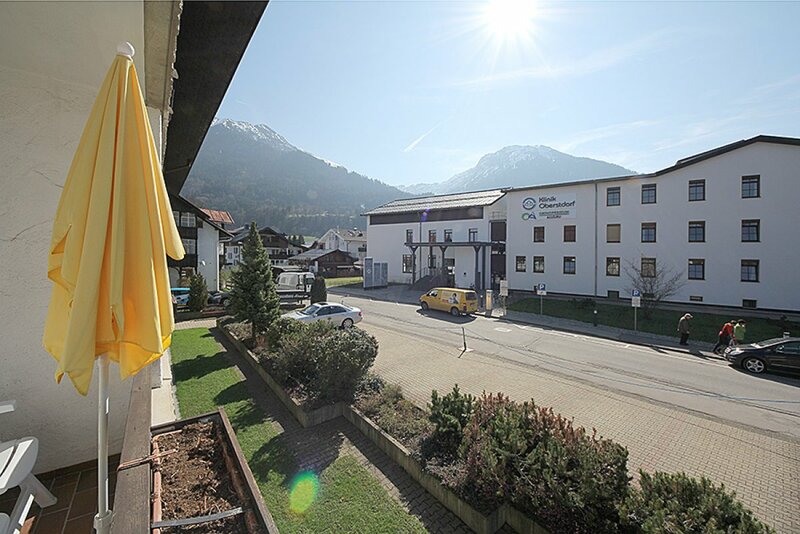 Location: Quiet and centrally located in the climatic health resort of Oberstdorf, within walking distance (500 meters) from the town center with restaurants, bars and shops. The Nebelhorn cable car and the ice rink is about 1 km. Nearest railway station: Oberstdorf (500 m). Montana Haus: generosity and hospitality awaits you in Montana house with indoor swimming pool, hydrotherapy center, massage, fitness room, table tennis, reading area, games room, sauna, solarium and a large garden with children's playground. Parking and garage. Bike and ski storage room here. Wireless LAN. Your apartment: This nice furnished 3-room-apartment consists of a livingroom with sofasleeper, dinette, tv and radio, sleepingroom with doublebed, sofa, dinette, tv and radio, second 2. sleepingroom with doublebed, kitchen connected with livingroom, furnished with oven, dish washer and freezer, 2. small kitchen with coffeemachine and toaster, 2 bathrooms with shower and toilet, separate toilet. 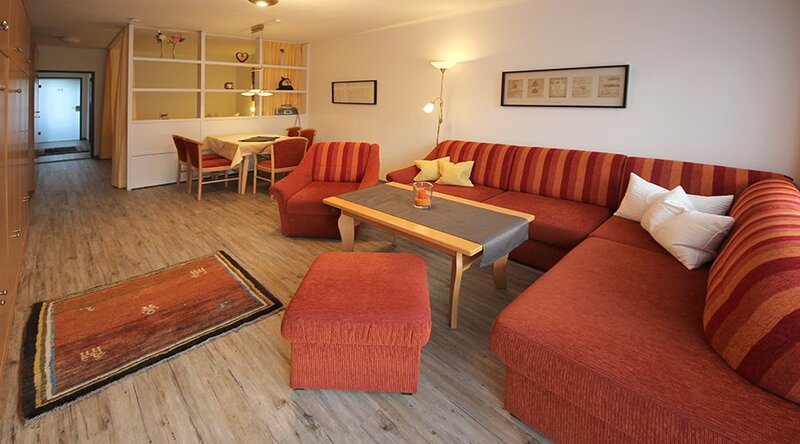 Montana Haus: generosity and hospitality awaits you in Montana house with indoor swimming pool, table tennis, reading area, games room, sauna, solarium and a large garden with children's playground. Parking and garage. Bike and ski storage room here. WLAN. 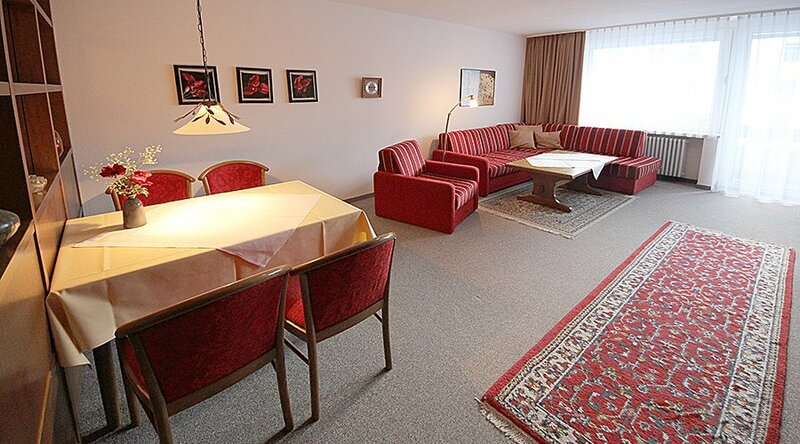 Your apartment: The tastefully modernized 3-room apartment on the 2nd floor offers generosity on 110 sqm. 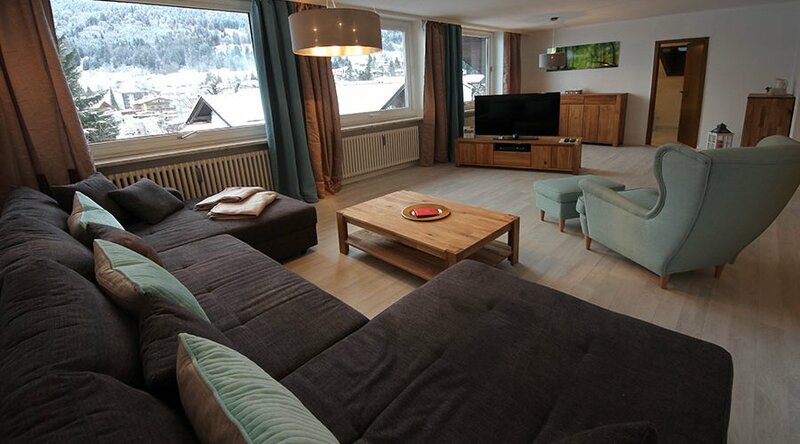 The bright living room with mountain view and modern cable TV, radio, CD player and Wlan invites you to relax with comfortable armchairs and sofa as well as a cushioned dinette. The fully equipped kitchen with oven, microwave, dishwasher etc. with a further dining area leaves nothing to be desired. 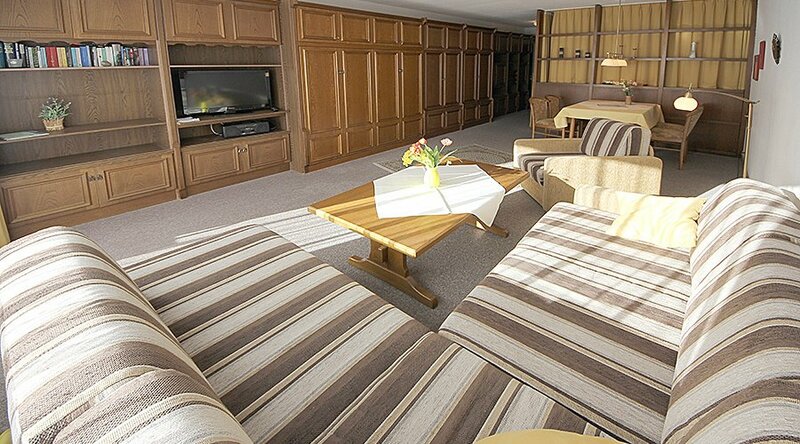 A large bedroom with double bed and TV as well as a smaller bedroom with 2 single beds offer extensive closet space. A guest toilet, hairdryer, as well as a bathroom with an American round shower tray ensure well-being. The covered western balcony invites you to relax in the afternoon sun with cozy armchairs. 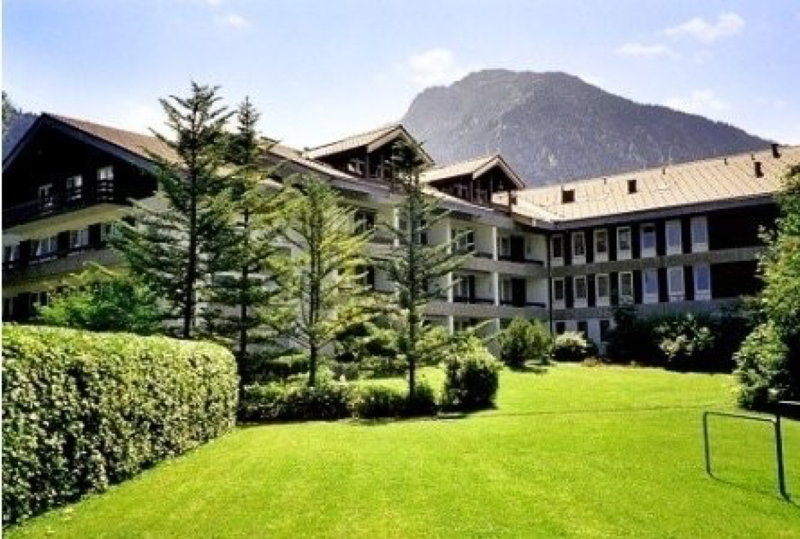 Location: Quiet and centrally located in the climatic health resort of Oberstdorf, within walking distance (500 meters) from the town center with restaurants, bars and shops. Your apartment: The newly renovated 3-bedroom apartment impresses with its generosity. 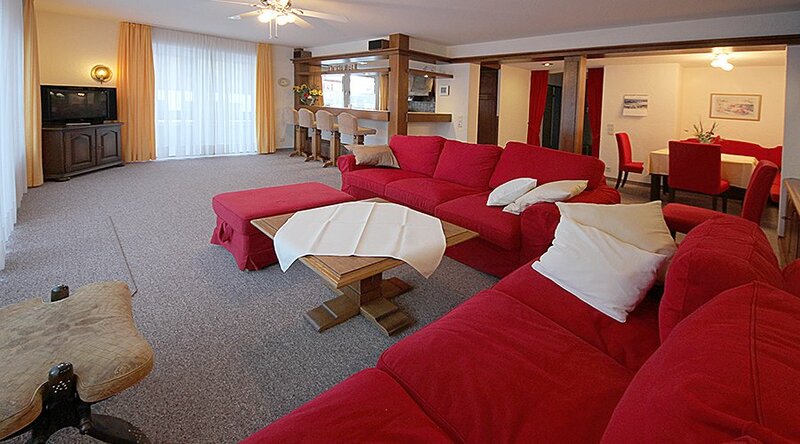 Guests can expect a decorated in shades of red living room with comfortable sofa (sleeping), dining area for 6 people, color TV and radio as well as an open kitchen, visually separated from the living room by a breakfast bar with 4 seats. 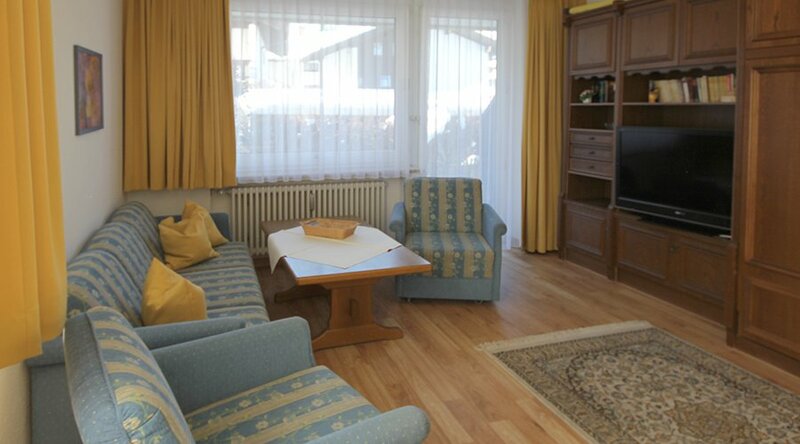 Another living room consists of a double bed, wardrobe, dining area and cozy reading area, color TV and Radio. The third bedroom has a double bed and wardrobe. 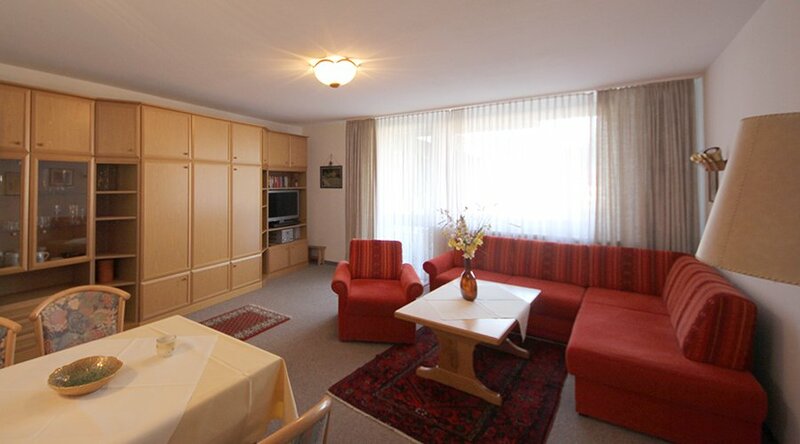 The kitchen is fully equipped with oven, dishwasher, toaster, kettle and refrigerator. There are 2 bathrooms with shower / toilet or bathtub and a separate toilet. 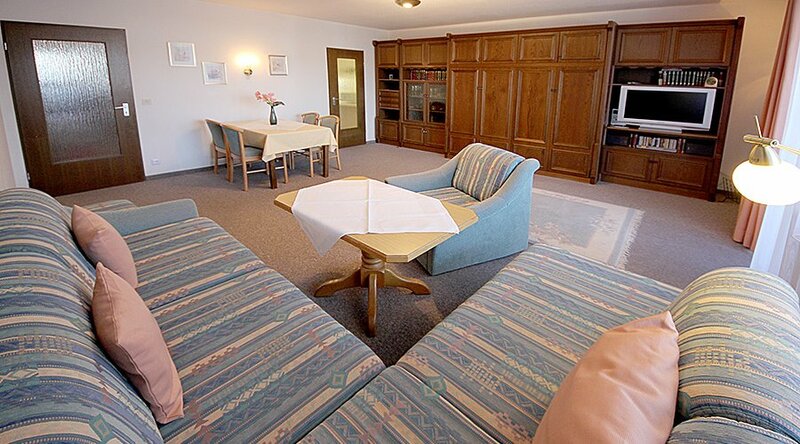 Location: Quiet and centrally located in the climatic health resort of Oberstdorf, within walking distance (500 meters) from the town center with restaurants, bars and shops. The Nebelhorn cable car and the ice rink is about 1 km. The 9-hole golf course is 4 km away. Nearest railway station: Oberstdorf (500 m). Your apartment: This spacious and nice furnished 3* 2-room-apartment consists of a livingroom with sofa, dinette, flat screen and radio, cd-player, sleepingroom with double bed, kitchen with stove, oven, freezer, dishwasher, waterboiler, toaster and coffeemachine as well as a bathroom with bathtub and provision for shower, toilet. Your apartment: The bright and friendly 2-bedroom apartment offers all the comforts. 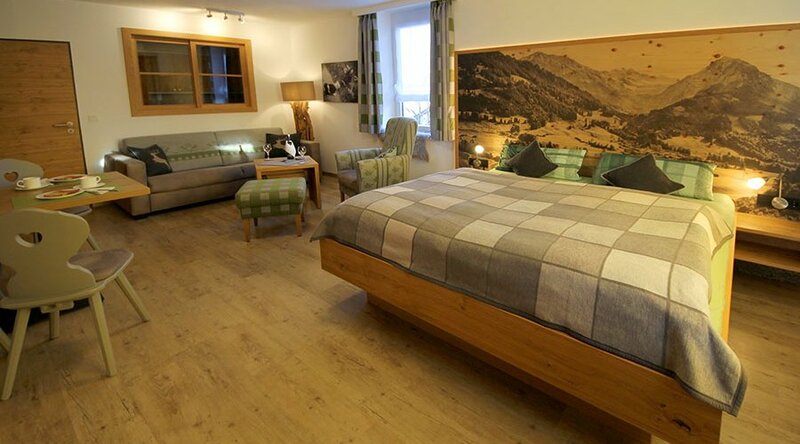 The sleepingroom is furnished with a double bed, bedside tables and a spacious wardrobe. 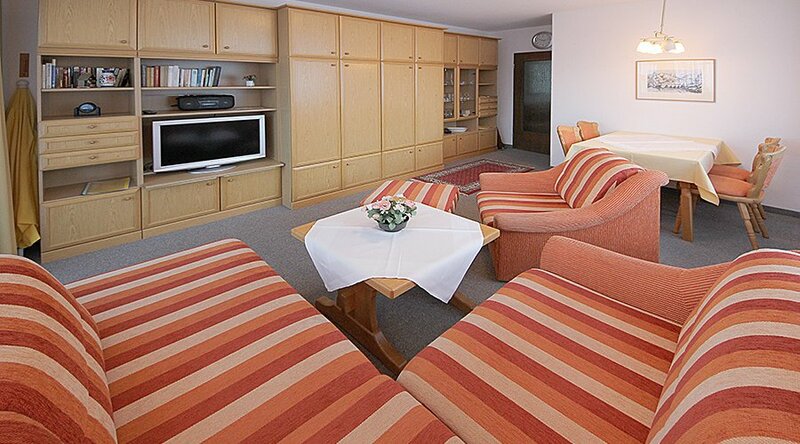 The living room has a wall unit with 2 beds, morderne sofa, dining area, color TV and radio. The fully equipped kitchen includes oven, dishwasher and coffee maker. Bathroom with shower / WC. Your apartment: The modern and nice furnished, very bright and well maintained 2-bedroom apartment has a living room with comfortable sofa, dining area, modern wall unit with flat screen TV, mini-stereo system with CD player and cassette deck and radio. 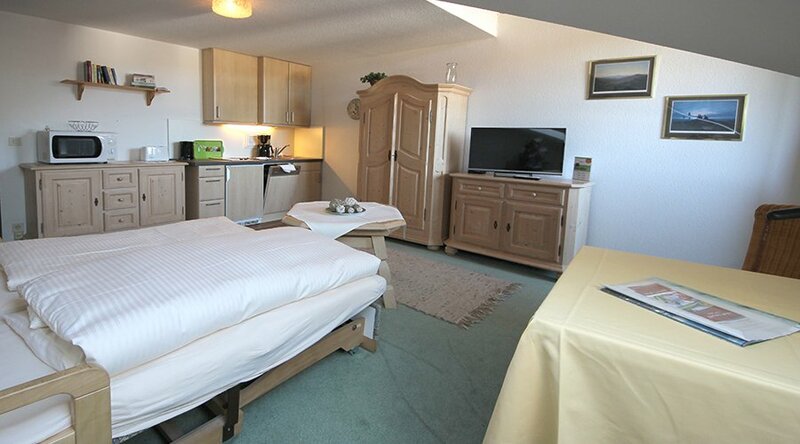 The bedroom is spacious and with double bed and wardrobe. 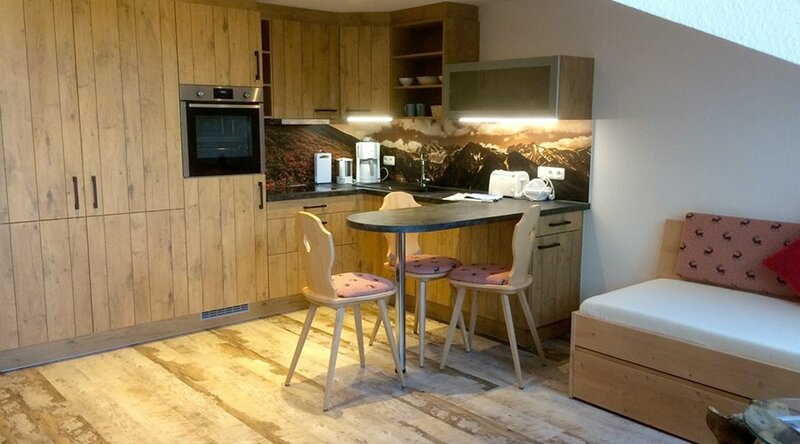 The fully equipped open kitchen has coffee maker, kettle, toaster, electric stove, oven, freezer and dishwasher. The modern bathroom has a shower, toilet. 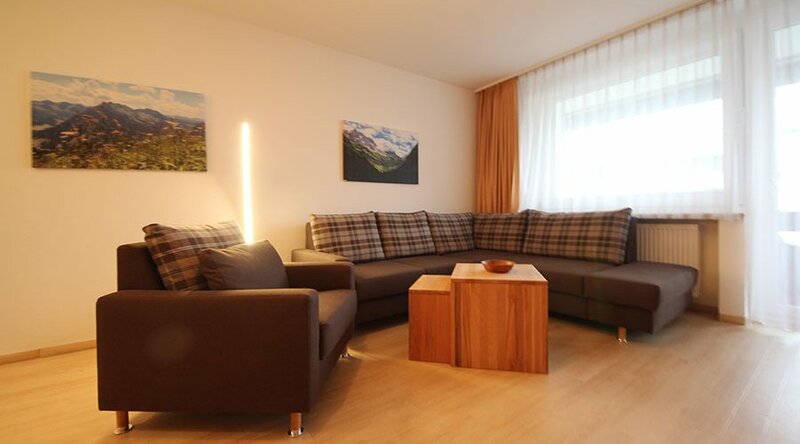 Your apartment: This spacious and nice furnished 2-room-apartment consists of a livingroom with 2 foldaway beds, sofa, dinette, tv and radio, sleepingroom with double bed, kitchen with coffeemachine as well as a bathroom with shower and toilet. Your apartment: This spacious and nice furnished 2-room-apartment consists of a livingroom with 2 foldaway beds, sofa, dinette, tv and radio, sleepingroom with double bed, kitchen with oven, waterboiler and coffeemachine as well as a bathroom with shower, toilet. 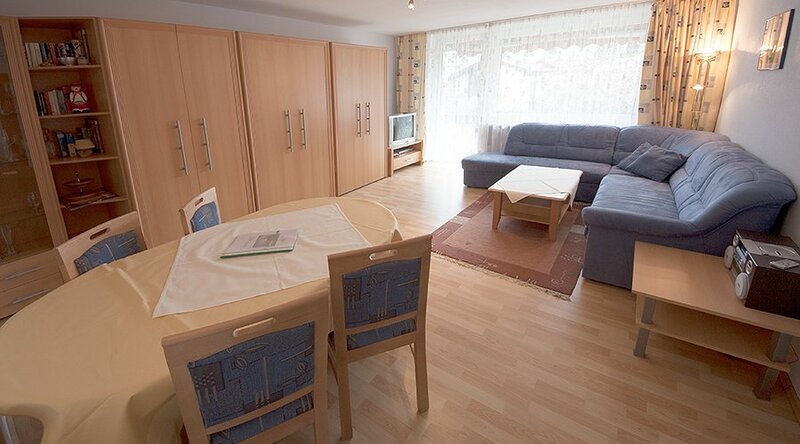 Your apartment: This spacious and nice furnished 2-room-apartment consists of a livingroom with 2 foldaway beds, sofa, dinette, tv and radio, sleepingroom with double bed, kitchen with oven, waterboiler and coffeemachine as well as a bathroom with bathtub and provision for shower, toilet. 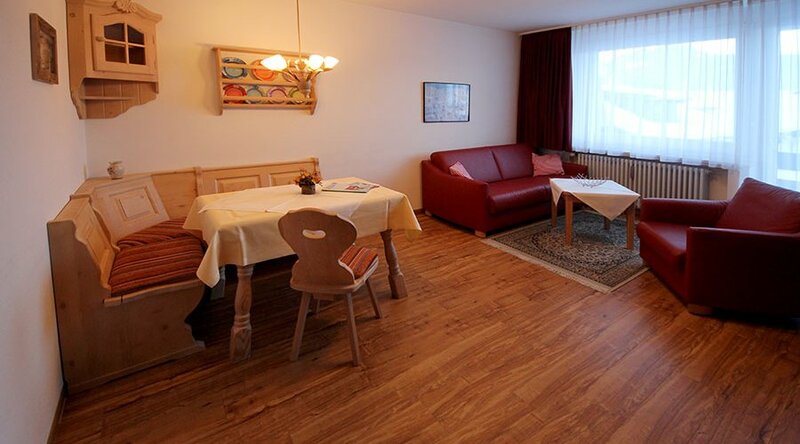 Your apartment: This spacious and nice furnished 2-room-apartment consists of a livingroom with 2 foldaway beds, sofa, dinette, tv and radio, sleepingroom with double bed, kitchen with oven and coffeemachine as well as a bathroom with shower, toilet. 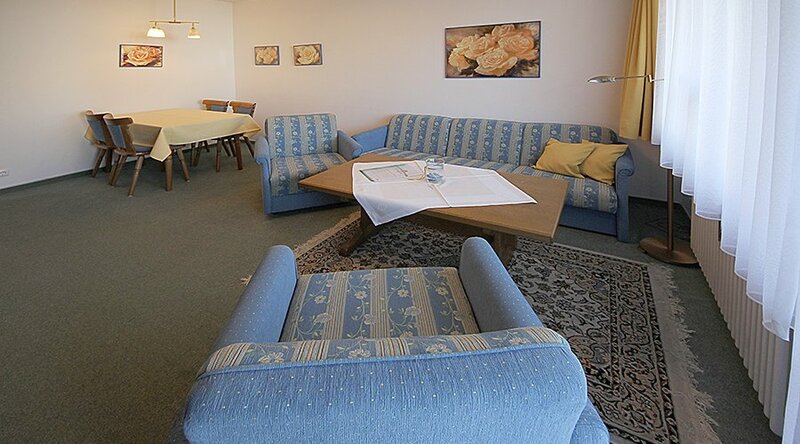 Location: Quiet and centrally located in the climatic health resort of Oberstdorf, within walking distance (500 meters) from the town center with restaurants, bars and shops. Nearest railway station: Oberstdorf (500 m). Montana Haus: generosity and hospitality awaits you in Montana house with indoor swimming pool, hydrotherapy center, massage, fitness room, table tennis, reading area, games room, sauna, solarium and a large garden with children's playground. Parking on request and garage included. Bike and ski storage room here. Wireless LAN for a fee. Your apartment: This spacious and high-quality furnished 2-room-apartment consists of a livingroom with sofa, dinette, tv, dvd-player and stereo-system, sleepingroom with double bed, kitchen with microwave, dish washer, big fridge with freecer, waterboiler, toaster and coffeemachine as well as a bathroom with bathtub and provision for shower, toilet. Balcony with awning. Montana Haus: generosity and hospitality awaits you in Montana house with indoor swimming pool, hydrotherapy center, massage, fitness room, table tennis, reading area, games room, sauna, solarium and a large garden with children's playground. Parking and garage. Bike and ski storage room here. Wireless LAN for free. Your apartment: This spacious and nice furnished 2-room-apartment consists of a livingroom with 2 foldaway beds, sofa, dinette, flat screen and radio, sleepingroom with double bed, kitchen with oven, dishwasher and coffeemachine as well as a bathroom with bathtub and provision for shower, toilet. Montana Haus: generosity and hospitality awaits you in Montana house with indoor swimming pool, hydrotherapy center, massage, fitness room, table tennis, reading area, games room, sauna, solarium and a large garden with children's playground. Parking and garage. Bike and ski storage room here. Wireless LAN for a fee. 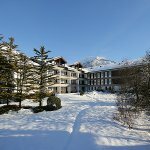 Location: Quiet and centrally located in the climatic health resort of Oberstdorf, within walking distance from the town center with restaurants, bars and shops. The Nebelhorn cable car and the ice rink is about 1 km. Nearest railway station: Oberstdorf. Your apartment: The welcoming 1 ½-room apartment boasts generous. The living room has a cozy sitting area, 2 fold-away beds, a dining area, modern wall unit with flat screen TV and Radio. By a room divider curtain and optically separated sleeping area is furnished with a double bed. 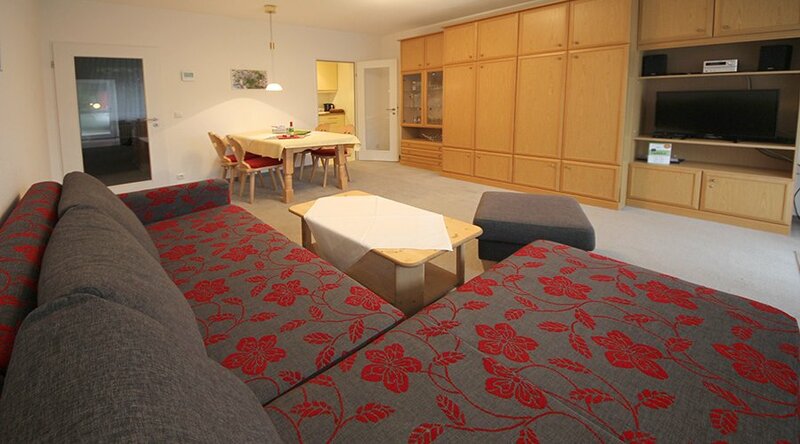 The fully equipped kitchen has oven, dishwasher, coffee maker and toaster. The modern bathroom has a shower, toilet. 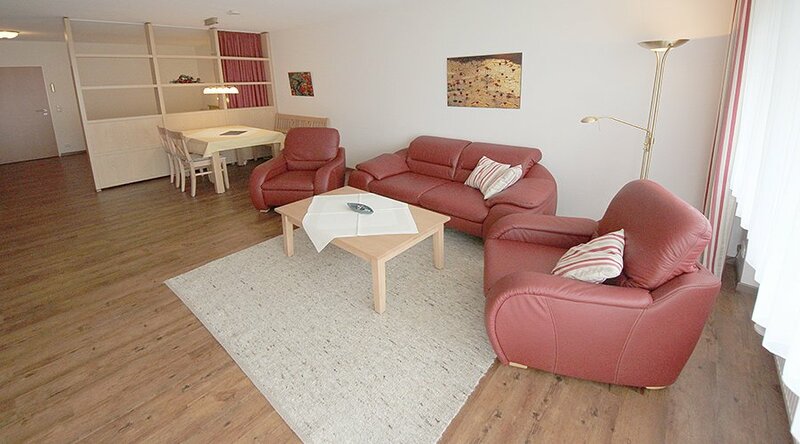 Your apartment: This nice 1.5-room-apartment consists of a livingroom with 2 foldaway beds, sofa, dinette, tv and radio, visual separated sleepingroom with 2 single beds, kitchen with oven and a dishwasher as well as a bathroom with shower, toilet. Your apartment: This cozy 1 ½-room apartment has a living room with 2 foldaway beds, sofa, dining table, TV and radio, by partitions and curtains separate bedroom with two single beds, kitchen with dishwasher and oven and a modern bathroom with shower and WC. Your apartment: This modern 1.5-room-apartment consists of a livingroom with 2 foldaway beds, sofa, dinette, flat screen and radio, visual separated sleepingroom with 2 single beds, kitchen with oven and dishwasher as well as a new bathroom with shower and toilet. Your apartment: The nicely furnished 1 ½-room apartment has a living room with 2 folding beds, sofa, dining area, flat screen TV and radio, separated by a room divider and curtain bedroom with two single beds. The newly fitted kitchen is equipped with a oven and dishwasher. The recently renovated bathroom has a shower with glass wall and toilet. Your apartment: This nice 1.5-room-apartment consists of a livingroom with 2 foldaway beds, sofa, dinette, tv and radio, visual separated sleepingroom with 2 single beds, kitchen with oven and dishwasher as well as a bathroom with shower, toilet. 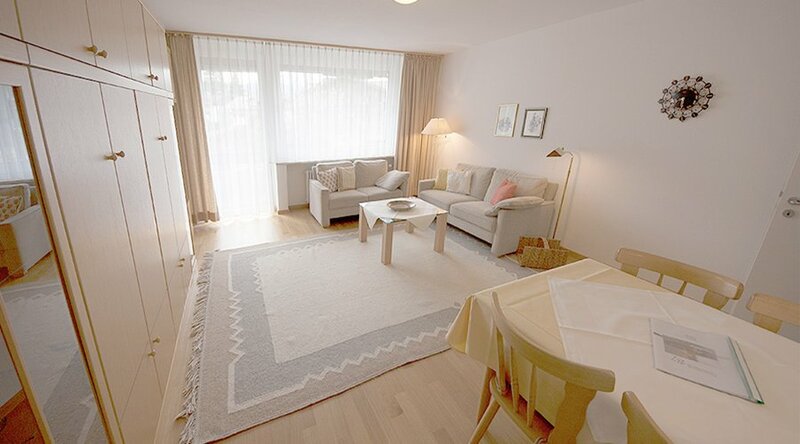 Your apartment: This nice and new renovated 1.5-room-apartment consists of a livingroom with 2 foldaway beds (1.60m x 2.00m), sofa, dinette, flatscreen-tv, dvd-player and radio, safe, visual separated sleepingroom with 2 single beds, kitchen with oven, dish washer and microwave as well as a bathroom with bathtub and provision for shower, toilet. Montana Haus: generosity and hospitality awaits you in Montana house with indoor swimming pool, hydrotherapy center, massage, fitness room, table tennis, reading area, games room, sauna, solarium and a large garden with children's playground. Parking and garage. Bike and ski storage room here. Wireless LAN included. Your apartment: The comfortably furnished 1½-room apartment in country style has a living room with 2 foldaway beds, upholstered furniture, dining area, modern flat screen with radio, separated by a partition bedroom with a double bed (with two separate mattresses), kitchen with oven and a bathroom with walk-in shower, WC. Your apartment: This nice 1.5-room-apartment consists of a livingroom with 2 foldaway beds, sofa, dinette, tv and radio, visual separated sleepingroom with 2 single beds, kitchen with oven as well as a bathroom with bathtub and provision for shower, toilet. 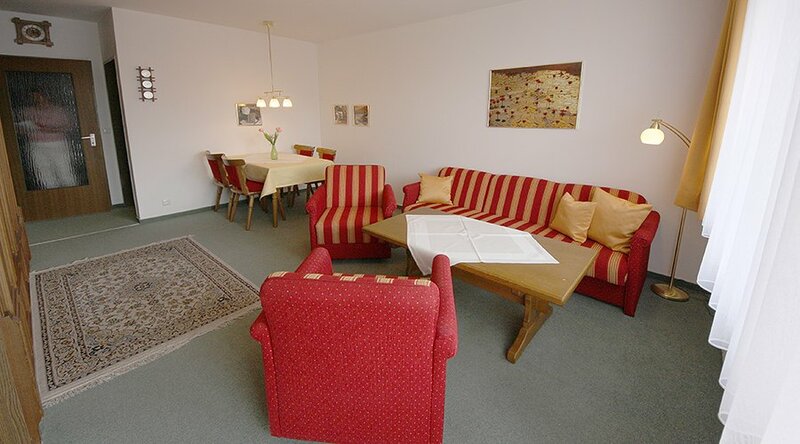 Your apartment: This nice 1.5-room-apartment consists of a livingroom with 2 foldaway beds, sofa, dinette, tv and radio, visual separated sleepingroom with 2 single beds, kitchen with waterboiler, toaster and coffeemachine as well as a bathroom with shower, toilet. 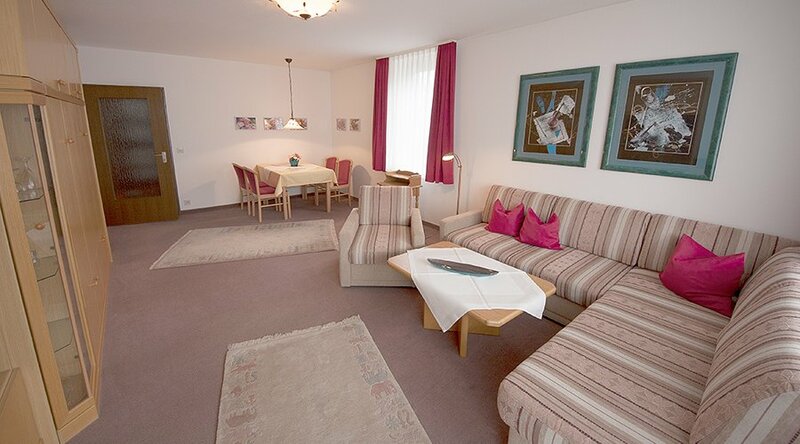 Your apartment: This nice 1.5-room-apartment consists of a livingroom with 2 foldaway beds, sofa, dinette, flat screen and radio, visual separated sleepingroom with 2 single beds, kitchen with oven and dish washer as well as a new renovated bathroom with shower and toilet. Your Apartement: The nicely furnished 1-room apartment has a living / sleeping room with 2 single beds, couch, dining area, color TV and radio, kitchen with microwave, and a bathroom with bath and shower, WC. 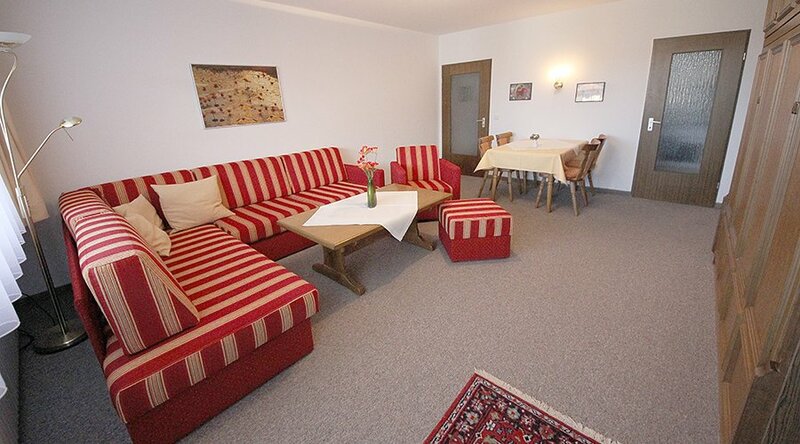 Location: Quiet and centrally located in Oberstdorf, within walking distance (500 meters) from the town center with restaurants, bars and shops. 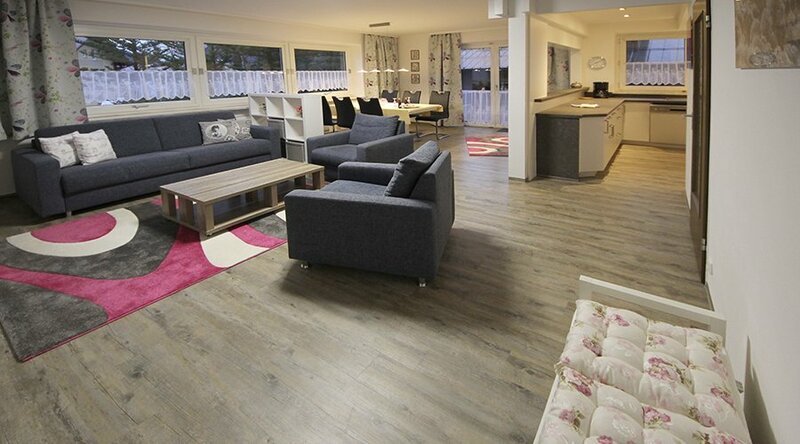 Montana Haus: with indoor swimming pool, hydrotherapy center, fitness room, table tennis, reading area, games room, sauna, solarium and a large garden with children's playground. Parking and garage. Bike and ski storage room here. Wireless. Your apartment: arrival and well-being is the motto of this modern apartment. The bright living / dining / sleeping area with balcony is equipped with a comfortable armchair and a dream sofa as well as a cozy dining area. 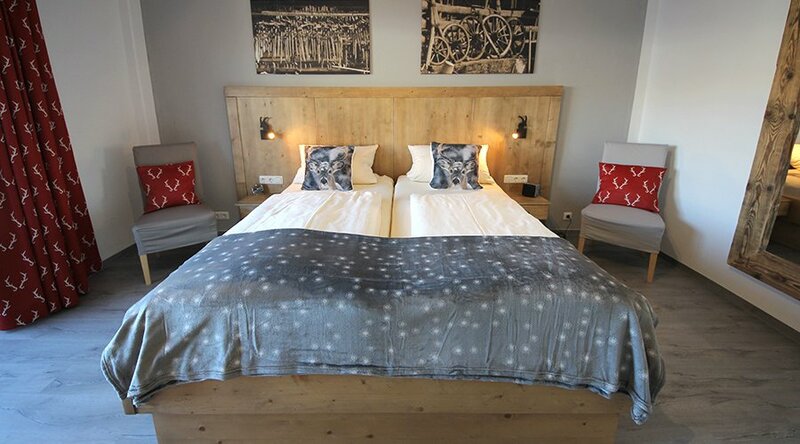 In the double bed you can dream wonderful under the mountain peaks. 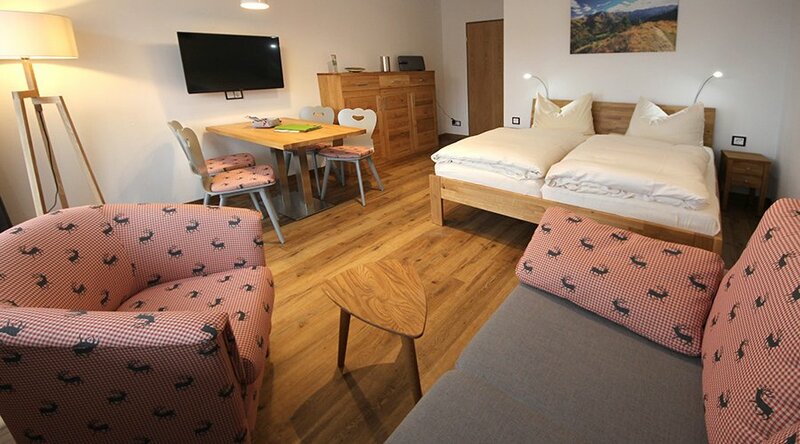 The 55 "flat-screen TV is embedded in a reclaimed wood wall and can be seen from all positions in the room.The fully equipped kitchen has dishwasher, coffee machine, toaster, kettle, egg cooker and oven / hob.The modern bathroom has a walk-in rain shower, WC and hairdryer.Wireless internet. Your apartment: This nice 1-room-apartment consists of a livingroom with 2 foldaway beds, sofa-sleeper, dinette, tv and radio, kitchen with oven as well as a renovate bathroom with shower, glas wall and toilet. 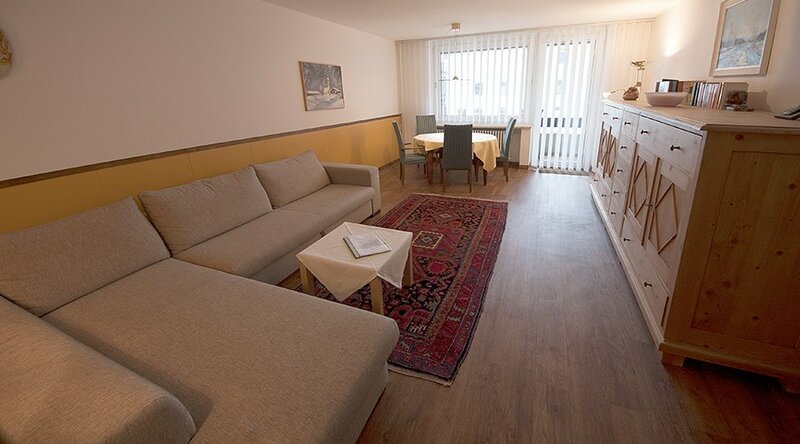 Your apartment: This nice and small studio consists of a living-sleepingroom with 2 foldaway beds, sofa, armchair, cupboard, dinette, tv, modern kitchenette with oven, ceramic hob, fridge, coffee maker, toaster and kettle, bathroom with shower and toilet. 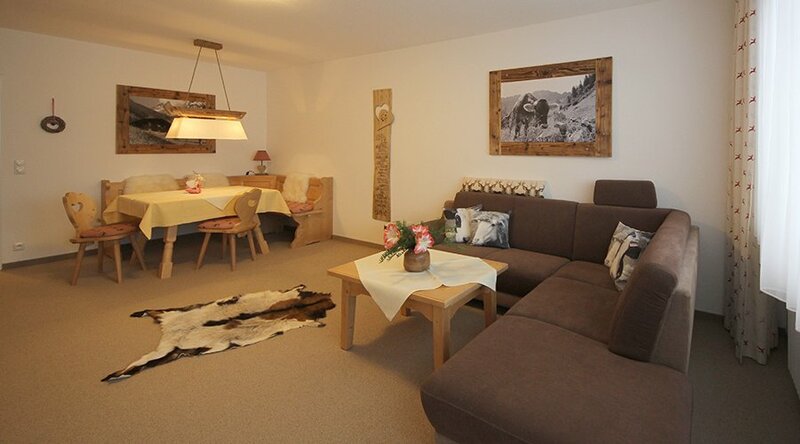 Your apartment: The comfortably furnished in chalet style 1-room apartment has a living / sleeping room with double bed (with two separate mattresses), extendable upholstery for a third person, dining area, flat screen TV and radio with CD player. Bathroom with shower and toilet. 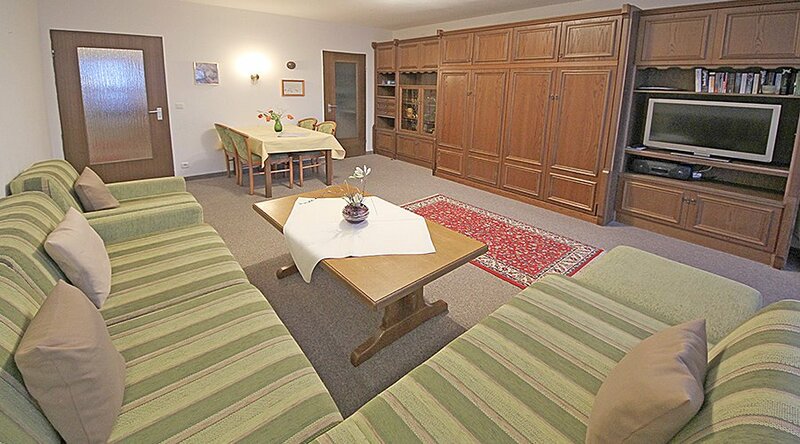 Montana House with indoor pool / sauna (town center) 1 room (41 sqm), max. 3 persons, 2nd floor, south-east balcony, pets are allowed. Your apartment: This nice 1-room-apartment consists of a livingroom with 2 foldaway beds, sofa-sleeper, dinette, tv and radio, kitchen with oven as well as a bathroom with shower, toilet. Modern kitchen with oven, microwave, coffeemaker, toaster and kettle and bathroom with shower, toilet. Your apartment: The newly renovated, modern 1-room apartment has a living room with 2 fold-away beds, dining area, a comfortable sofa with armchair and a modern flat screen TV. The newly fitted kitchen is equipped with oven and dishwasher. The modern bathroom has a shower with glass wall and toilet. Your apartment: This nice 1-room-apartment consists of a livingroom with 2 foldaway beds, sofa-sleeper, dinette, flat screen and radio, kitchen with oven, dishwasher, microwave as well as a bathroom with shower, toilet. Your apartment: This nice, new renovate 1-room-apartment consists of a livingroom with 2 foldaway beds, sofa-sleeper, dinette, flat screen and radio, kitchen with minioven and dishwasher as well as a modern bathroom with shower and toilet. Your apartment: This rustic 1-room-apartment consists of a livingroom with 2 foldaway beds, sofa-sleeper, dinette, tv and radio, kitchen with oven and dishwasher as well as a bathroom with shower, toilet. 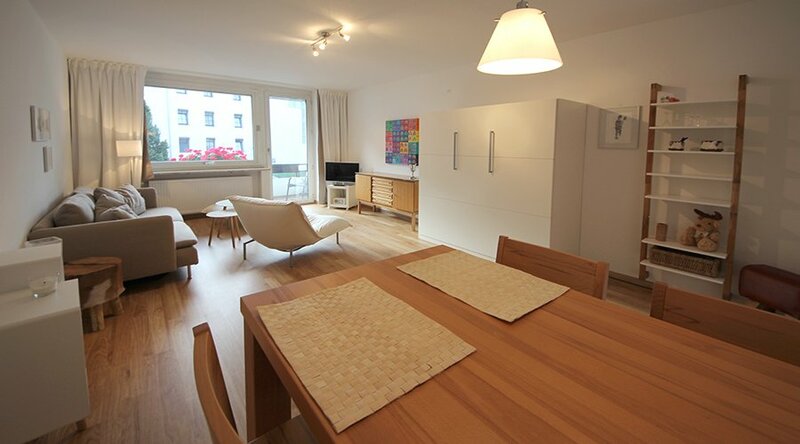 Your apartment: This nice 1-room-apartment consists of a livingroom with 2 foldaway beds, sofa-sleeper, dinette, flat screen and radio, kitchen with oven and coffeemachine as well as a new renovate bathroom with shower and glas wall, toilet. Your apartment: The nicely furnished 1-room apartment consists of a living room with 2 fold away beds, sofa bed, dining area, TV and radio. The renovate kitchen has a coffee machine, kettle and a toaster. The modern bathroom is with a shower and a toilet. Your apartment: This rustic 1-room-apartment consists of a livingroom with 2 foldaway beds, sofa-sleeper, dinette, tv and radio, kitchen with oven and dishwasher as well as a bathroom with shower and toilet. 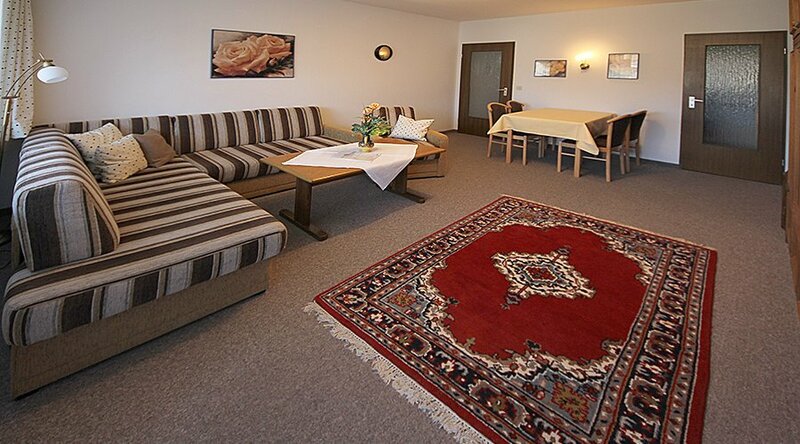 Montana House with indoor pool / sauna (town center) 1 room (28 sqm), max. 2 persons, attic, small balcony, pets are not allowed. Your apartment: The country-style studio with panoramic views consists of a large living room with sofa bed, armchair, wardrobe, dining table, TV, kitchenette with ceramic hob, microwave and dishwasher, refrigerator and coffee maker and bathroom with shower and toilet. 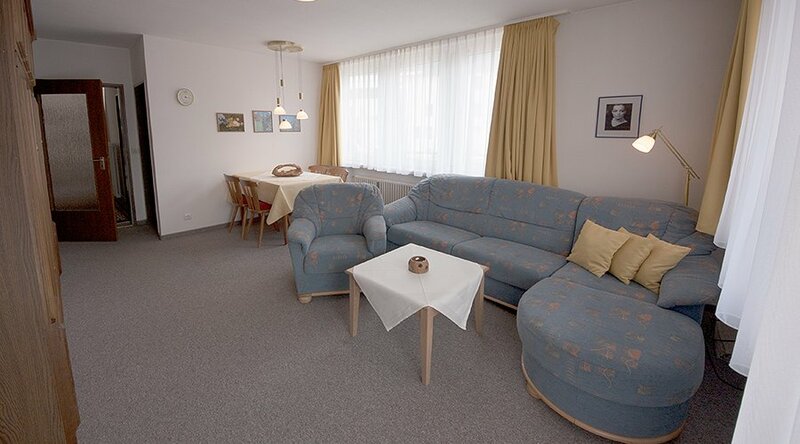 Your apartment: This nice and small studio consists of a living-sleepingroom with double bed, sofa, cupboard, dinette, tv, kitchenette with hotplates, fridge, microwave and coffeemachine, bathroom with shower and toilet. Your apartment: This nice 1-room-apartment consists of a livingroom with 2 foldaway beds, sofa-sleeper, dinette, tv and radio, kitchen with oven as well as a bathroom with bathtub and provision for shower, toilet. 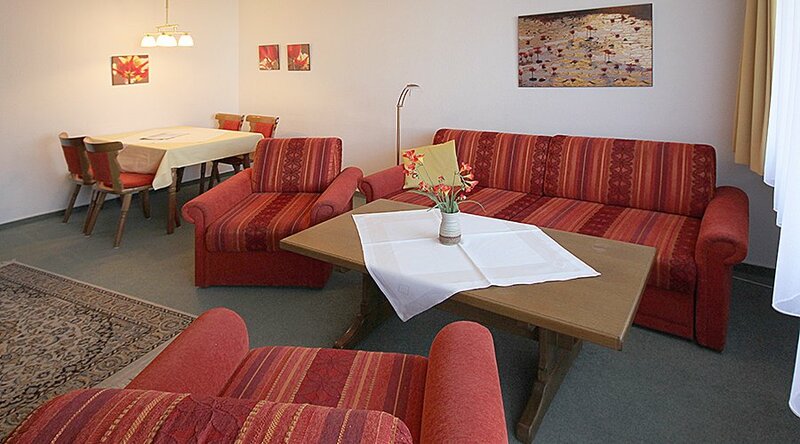 Location: Quiet and centrally located in the climatic health resort of Oberstdorf, a short walk (500m) from the village center with restaurants, bars and shops. The Nebelhorn and the ice rink are approximately 1 km away. The 9-hole golf course is 4 km away. 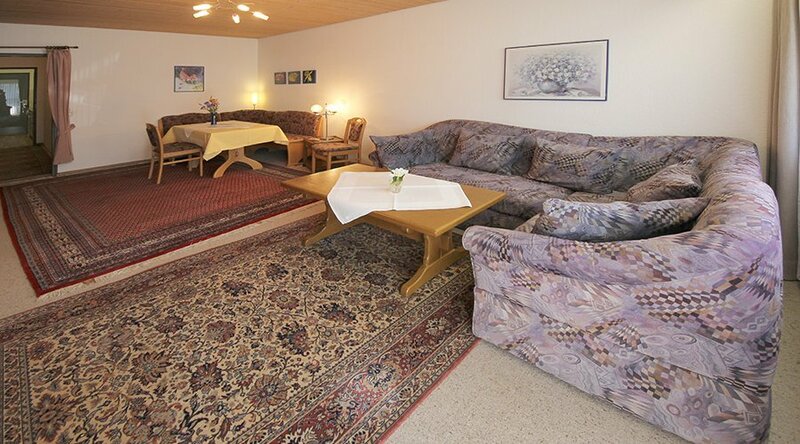 Nearest train station: Oberstdorf (500 m). Montana House: hospitality and generosity awaits you in the Montana House with indoor swimming pool, hydrotherapy center, massage, fitness room and table tennis room, reading area, game room, sauna, solarium and a large garden with children's playground. Parking and garage. Bicycle and ski cellar in the house. Wireless Internet for a fee. Your apartment: The partially refurnished one-bedroom apartment has a living room with sofa bed, 2 foldaway beds, dining area, flat screen TV and radio; newly renovated fully equipped kitchen with oven, dishwasher, microwave, kettle, toaster and coffee maker and a bathroom with shower, toilet. Montana Haus: hospitality and generosity awaits you in the Montana House with indoor swimming pool, hydrotherapy center, massage, fitness room and table tennis room, reading area, game room, sauna, solarium and a large garden with children's playground. Parking and garage. Bicycle and ski cellar in the house. Wireless Internet for a fee. 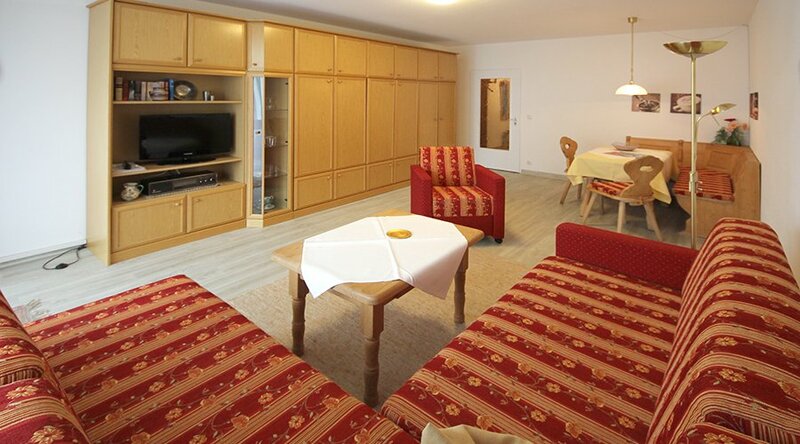 Your apartment: This nice 1-room-apartment consists of a livingroom with 2 foldaway beds, sofa-sleeper, dinette, tv and radio, kitchen with oven, waterboiler and coffeemachine as well as a bathroom with bathtub and provision for shower, toilet. Your apartment: This rustic 1-room-apartment consists of a livingroom with 2 foldaway beds, sofa-sleeper, dinette, tv and radio, kitchen with oven and microwave as well as a bathroom with bathtub and provision for shower, toilet. 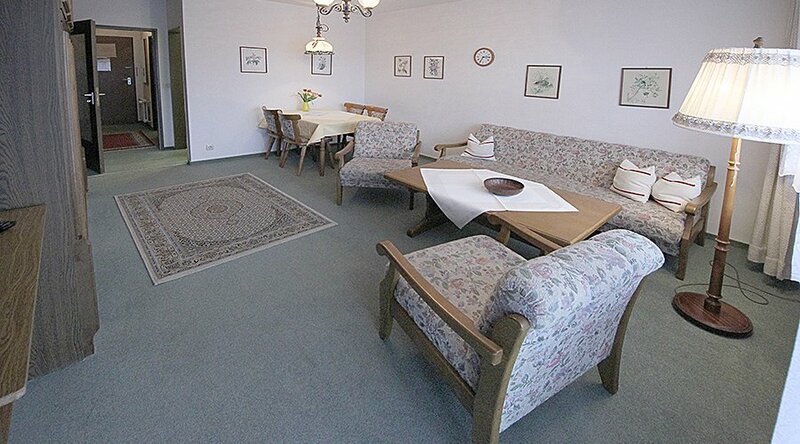 Living room with 2 foldaway beds, couch corner, dining table, kitchen with coffee machine, toaster, kettle. Bathroom with bathtub, toilet. Montana House: hospitality and generosity awaits you in the Montana House with indoor swimming pool, hydrotherapy center, massage, fitness room and table tennis room, reading area, game room, sauna, solarium and a large garden with children's playground. Parking and garage. Bicycle and ski cellar in the house. Wireless Internet. Your apartment: The rustically furnished 1-room apartment has 2 foldaway beds, dining area, flat screen TV, small couch and TV chair. In the kitchen consits of a hob, microwave, coffee maker, toaster and kettle. The bathroom is equipped with bathtub. Your apartment: This nice 1-room-apartment consists of a livingroom with 2 foldaway beds, sofa, dinette, flat screen and radio, kitchen with waterboiler, toaster and coffeemachine as well as a bathroom with bathtub and provision for shower, toilet.